Cotton fiber maturity is an important factor for determining the commercial value of cotton. How fiber cell wall development affects fiber maturity is not well understood. A comparison of fiber cross-sections showed that an immature fiber (im) mutant had lower fiber maturity than its near isogenic wild type, Texas marker-1 (TM-1). 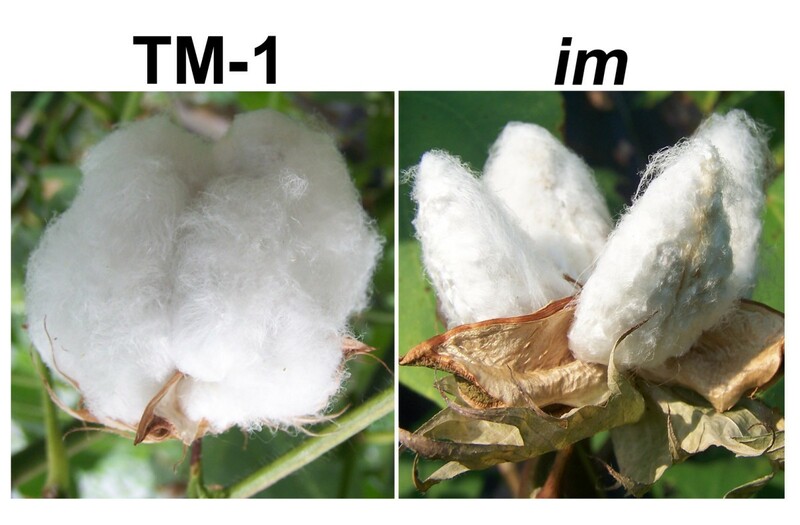 The availability of the im mutant and TM-1 provides a unique way to determine molecular mechanisms regulating cotton fiber maturity. Transcriptome analysis showed that the differentially expressed genes (DEGs) in the im mutant fibers grown under normal stress conditions were similar to those in wild type cotton fibers grown under severe stress conditions. The majority of these DEGs in the im mutant were related to stress responses and cellular respiration. Stress is known to reduce the activity of a classical respiration pathway responsible for energy production and reactive oxygen species (ROS) accumulation. Both energy productions and ROS levels in the im mutant fibers are expected to be reduced if the im mutant is associated with stress responses. In accord with the prediction, the transcriptome profiles of the im mutant showed the same alteration of transcriptional regulation that happened in energy deprived plants in which expressions of genes associated with cell growth processes were reduced whereas expressions of genes associated with recycling and transporting processes were elevated. We confirmed that ROS production in developing fibers from the im mutant was lower than that from the wild type. The lower production of ROS in the im mutant fibers might result from the elevated levels of alternative respiration induced by stress. The low degree of fiber cell wall thickness of the im mutant fibers is associated with deregulation of the genes involved in stress responses and cellular respiration. The reduction of ROS levels and up-regulation of the genes involved in alternative respirations suggest that energy deprivation may occur in the im mutant fibers. Cotton (Gossypium sp.) is the world’s most important natural fiber. Fiber quality is classified based on its physical properties such as length, strength, fineness, and maturity [1, 2]. Among these properties, the fiber fineness and maturity are not well defined or understood [1, 2]. The term of fiber fineness has been used to define fiber perimeter, diameter, cross-sectional area, linear density (mass per unit length), and specific fiber surface. Among them, the linear density is most often used to define fiber fineness by the textile industry. In plant physiological terms, fiber maturity refers to the degree of fiber cell wall thickness [2, 3]. Since the fiber maturity and fineness determine the number of cotton fibers in a yarn, they directly affect yarn strength, performance, and dyeing efficiency [2, 4]. Cotton fibers with either low or high maturity are classified as low grade for making yarns because less mature fibers with thin cell walls tend to be weak and easily broken during the spinning process, while overly mature fibers with thick cell walls produce coarse and thick yarns that are unfavorable to consumers. To measure fiber maturity and fineness, cell wall area (A) and perimeter (P) of multiple fibers need to be measured using the microscopic images from fiber cross-sections [2, 3]. Absolute value of fiber maturity defined as circularity (θ) representing the degree of fiber cell wall development is calculated using the equation, θ = 4πA/P2[2–4]. Despite its superiority for measuring fiber maturity and fineness, microscopic image analysis has not been frequently used due to its long and laborious process. For a quick and automated assessment, fiber fineness and maturity have been indirectly measured as “micronaire” (MIC) that is determined by measuring air-flow resistance through a plug of cotton fibers of a given weight. Despite the MIC value representing a combination of fiber maturity and fineness of cotton fibers, the MIC is an effective way of measuring fiber maturity of commercial cotton varieties. Thus, textile industry and agricultural marketing services have used the MIC values as a key quality assessment parameter of determining the fiber maturity [1, 2]. Changes in temperature, water content of soil, and mineral nutrition significantly affect the MIC values of cotton fibers: therefore, environmental factors affect MIC value of cotton fibers [1–5]. When grown under normal environmental conditions, a wild type Upland cotton cultivar produces fluffy cotton bolls with MIC values ranging from 3.0 to 5.5 (Figure 1). When grown under severe stress conditions such as drought, cold temperature, or pathogens, the same cultivar produces non-fluffy bolls with MIC values less than 3.0 [6–8]. In the early 1970s, an immature fiber (im) mutant that produces non-fluffy bolls with low MIC fibers was discovered (Figure 1) . The phenotype of the im mutant grown under normal field conditions resembles that of the wild type plant grown under severe stress [7, 9–12]. This similarity suggested that the im mutation might be caused by a reduced ability of withstanding stress. Previously, we showed that the im gene mutation reduced fiber cell wall thickness, and the im gene located on chromosome 3 . Comparison of phenotypes from two near isogenic lines of Gossypium hirsutum . Wild type Texas Marker-1 (TM-1) shows fluffy bolls, whereas immature fiber (im) mutant shows non-fluffy bolls. In the current paper we utilize a comparative genomics approach to analyze the im mutant and its near isogenic line (NIL) wild type TM-1 in order to better understand how the im gene affects fiber cell wall development. Our transcriptome results show that the im gene reduces the degree of fiber cell wall thickness by altering the expressions of genes involved in stress responses and cellular respiration. In the cotton field where the two NILs were grown side by side under the same environmental conditions, wild type TM-1 showed a fluffy fiber phenotype, whereas im mutant had a non-fluffy boll (Figure 1). We manually measured fiber length and maturity from the developing fibers at four different developmental time points that represented the active elongation stage (10 days post anthesis, DPA), the transition stage (17 DPA) from elongation to secondary cell wall (SCW) biosynthesis stage, the active SCW biosynthesis stage (28 DPA), and the maturation stage (44 DPA) (Figure 2). Average fiber lengths from developing fibers (10, 17, and 28 DPA) of the im mutant were shorter (p value < 0.0001) than the equivalent fibers fromTM-1. TM-1 fibers elongated actively at 10 DPA (15.3 mm) and 17 DPA (25.6 mm), and reached maximal length at 28 DPA (36.8 mm). At the same DPAs, the average fiber lengths of the im mutant were 9.8 mm, 21.0 mm, and 30.0 mm that were 35.9%, 18.0% and 18.5% shorter than those of TM-1, respectively (Figure 2A). The final length of developed fibers from the im mutant was similar to that from TM-1 (Figure 2A). Comparisons of fiber properties from TM-1 wild type and im mutant. A. Fiber length comparison. The average fiber lengths of developing fibers at 10, 17, and 28 DPA were manually measured, and the average fiber length of mature fibers at 44 DPA was measured by AFIS. Average fiber lengths of developing fibers at each time point were calculated from two replicate samples with 30 ovules per replicate. The error bars represent SD. B. Microscopic image analyses. Cotton fibers at 17, 24, and 44 DPA from the TM-1 and im were cross-sectioned, embedded, and photographed. Fiber cell wall thickness between TM-1 and im mutant were compared using a microscopic image analysis (Figure 2B). At 17 DPA, cross-sections of TM-1 fibers were circular with thin but detectable secondary cell walls, while im mutant fibers appeared linear due to a lack or very low level of SCW cellulose. At 24 DPA, fiber cross-sections of both NILs were circular but TM-1 fibers were thicker than the im fibers. At 44 DPA, the fiber cell wall in the im fibers was clearly thinner than that in the TM-1 (Figure 2B). Table 1 shows the results for the quantitative comparison of the degrees of fiber cell wall thickness (θ) between two NILs. These results clearly show that the im mutation greatly affects thickening of the secondary cell wall in both developing and mature fibers. Affymetrix cotton GeneChip genome arrays were used to identify differentially expressed genes (DEGs) in developing fibers from TM-1 and im mutant. Expression levels of transcripts were compared at the 10, 17, and 28 DPA. Among the 21,854 transcripts contained in an array chip, 867 unique transcripts were differentially expressed genes (DEGs) at all three time points from the im mutant fibers with more than a 2 fold difference in transcript abundance compared to TM-1 fibers (Additional file 1). At all three stages, the number of down-regulated transcripts in the im mutant was more than that of up-regulated transcripts (Figure 3A). Most of the DEGs were developmentally-regulated only at one of the specific cotton fiber developmental stages, whereas 37 DEGs were identified at all three stages (Figure 3B). Among the 37 DEGs, 19 DEGs have a high degree of sequence similarity to known Arabidopsis orthologs; these were annotated and further analyzed (Table 2). 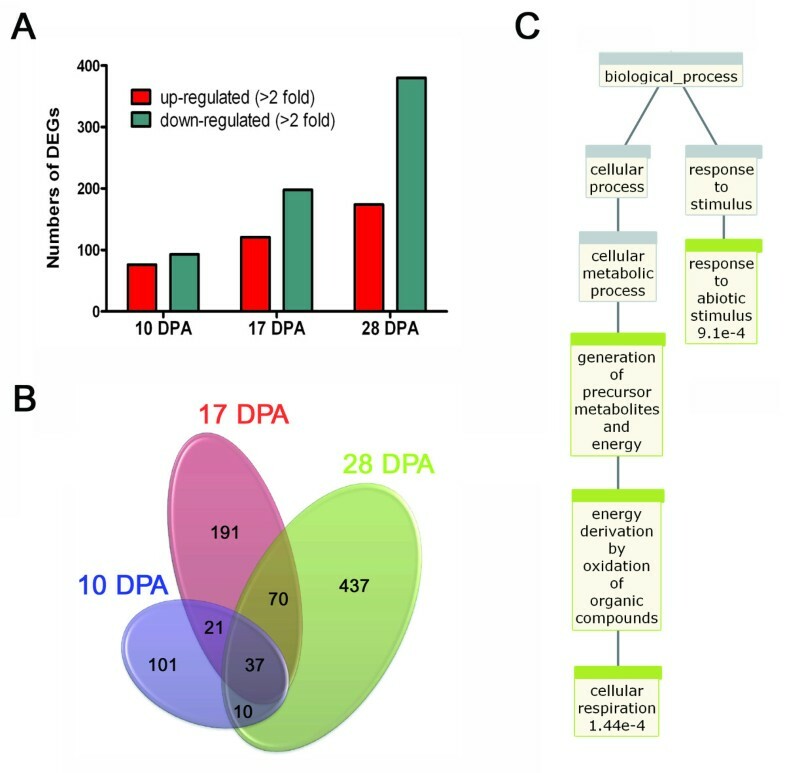 An enrichment analysis using BioMaps  showed that two biological processes involved in abiotic stimulus response (p = 0.009) and cellular respiration (p = 0.000144) were significantly enriched among the commonly identified DEGs (Figure 3C). Of the 19 DEGs, 10 DEGs are predicted to be involved in responses to abiotic or biotic stresses in Arabidopsis, 4 DEGs are in metal ion binding or transport, and 3 DEGs are in cellular respiration (Table 2). Summary of microarray analysis comparing TM-1 wild type and im mutant. A. 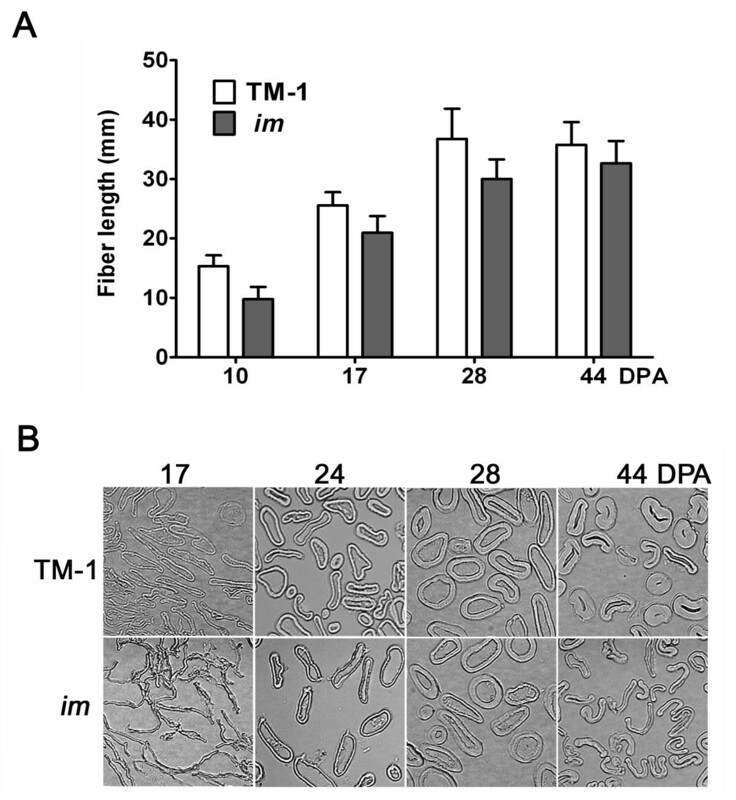 Comparison of up- or down-regulated DEGs at 10, 17, and 28 DPA in the im mutant fibers. B. Venn diagrams representing the common DEGs among the three developmental stages in the im mutant. C. BioMaps enrichment analysis from the common DEGs at 10, 17, and 28 DPA in the im mutant fibers. Genes involved in abiotic stimulus response (p = 0.009) and cellular respiration (p = 0.000144) were enriched in the im mutant fibers. The expression of genes involved in ethylene biosynthesis and pathway was changed substantially in the im mutant (Table 3). The six transcripts encoding 1-aminocyclopropane-1-carboxylate (ACC) oxidase (Ghi.798.1.S1_s_at, Gra.2141.1.S1_s_at, Ghi.6953.1.S1_s_at, Ghi.6502.1.S1_at, Ghi.8023.1.S1_at, and Ghi.7921.1.S1_x_at), a key enzyme producing ethylene hormone and a large number of AP2-ERF transcription factors were down-regulated in the developing fibers of the im mutant. In contrast, gibberellin 20 oxidase (Ghi.6164.1.A1_at), a key enzyme involved in gibberellins biosynthesis, was highly up-regulated in the im mutant fibers (17 and 28 DPA). The expression of transcripts involved in cell wall biosynthesis including xyloglucan endotransglycosylase (XET, GraAffx.8958.1.S1_s_at, Ghi.6236.1.S1_s_at, GhiAffx.63628.1.S1_at, and Ghi.4532.1.A1_at), pectin (GhiAffx.25797.1.S1_s_at and Ghi.5186.1.A1_at) and sucrose synthase (Ghi.8667.1.A1_at) were reduced in the im mutant fibers. In addition to AP2-ERFs, a large number of WRKY, NAC and MYB transcription factors involved in stress response and fiber development were also down-regulated in the im mutant (Table 3). 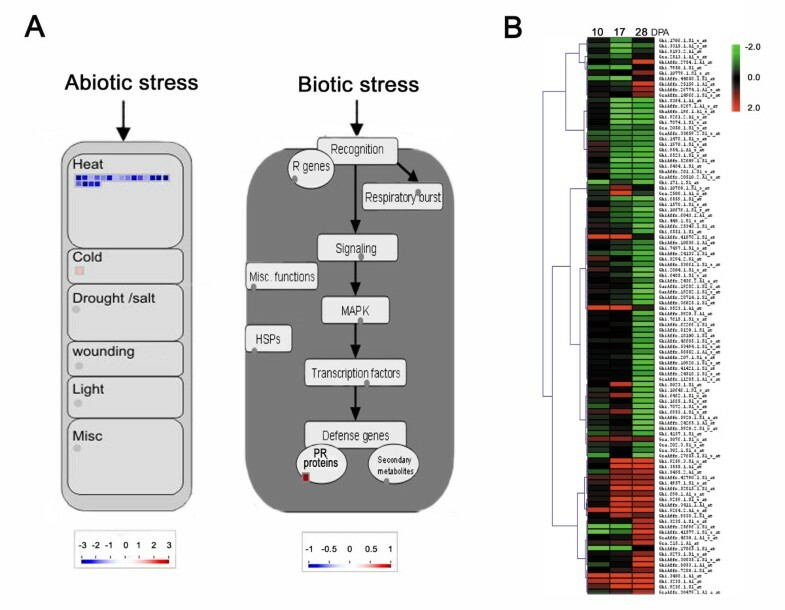 Numerous genes known to be involved in the response to abiotic and biotic stress were differentially regulated. Moreover, genes involved in protein synthesis and lipid metabolism known to be regulated by stress were also differentially regulated (Table 3). The expression patterns of the DEGs identified from the im mutant fibers were validated with quantitative real time PCR analysis (RT-qPCR). Differential expressions of 26 DEGs showed in the microarray analysis were validated by RT-qPCR. As shown in Figure 4A, genes involved in stress response were down-regulated in the im mutant fibers. These include the following: the GhNAC2 transcription factor (Ghi.3264.2.A1_s_at, ACI15342) previously shown to be differentially regulated in cotton leaves by cold stress and abscisic acid , an unknown NAC transcription factor (Ghi.6896.1.A1_s_at) showing 76% sequence similarity to GhNAC11 (AGC97441), an ethylene responsive element binding factor (EREBP3 or ERF3) that is a transcription repressor (Ghi.10747.1.S1_at) binding to GCC box or pathogenesis-related promoter element , a HVA22 protein (GhiAffx.8267.1.A1_s_at) known to be induced by abscisic acid and stress in barley aleurone cells , a gibberellic acid (GA) receptor (Gra.1544.1.A1_s_at) also known as GA insensitive dwarf1 (GID1) that restricts plant growth , and a pectin methylesterase (Ghi.5186.1.A1_at) that is an important cell wall enzyme involved in plant tolerance to chilling/freezing by the brassinosteroid hormone pathway . Other stress response genes were up-regulated in developing fibers of the im mutant (Figure 4B). These include the following genes: alternative oxidase 1 (AOX 1, Ghi.3408.1.A1_at) known as a target and regulator of stress responses , Toll/Interleukin-1 receptor nucleotide-binding sites Leu-rich repeat (TIR-NBS-LRR, GhiAffx.41878.1.S1_at) involved in biotic and abiotic stress response , a GA 20 oxidase (Ghi.6164.1.A1_at) induced by abiotic stress , allyl alcohol dehydrogenase (Ghi.8523.1.A1_at), cellulose synthase-like protein (CslE, Ghi.3562.1.A1_at), and α-expansin 8 (Ghi.2039.1.S1_x_at). Validation of array data by RT-qPCR analysis. A. Down-regulated genes in the im mutant. NAC2 transcription factor (Ghi.3264.2.A1_s_at), NAC 11-like transcription factor (Ghi.6896.1.A1_s_at), ethylene responsive element binding factor 3 (ERF3) transcription factor (Ghi.10747.1.S1_at), HVA22 protein (GhiAffx.8267.1.A1_s_at), GA receptor (Gra.1544.1.A1_s_at) and pectin methylesterase (Ghi.5186.1.A1_at). B. Up-regulated genes in the im mutant. alternative oxidase 1 (AOX 1, Ghi.3408.1.A1_at), TIR-NBS-LRR resistance protein (GhiAffx.41878.1.S1_at), GA 20 oxidase (Ghi.6164.1.A1_at), allyl alcohol dehydrogenase (Ghi.8523.1.A1_at), cellulose synthase-like protein (CslE, Ghi.3562.1.A1_at), and α-expansin 8 (Ghi.2039.1.S1_x_at). All RT-qPCR analyses were performed with three biological replications at each time point with five technical replications. The error bars represent SD. To identify the potential biological processes governing differential expressions of genes in the im mutant fibers, we analyzed the identified 867 DEGs using each of three different Gene Ontology (GO) term enrichment tools: Singular Enrichment Analysis (SEA), Parametric Analysis of Gene set Enrichment (PAGE), and MapMan [22, 23]. The GO categories identified by the three analyses (p-value ≤ 0.05) were separated into four different classes (Table 4). Class 1, “stress responding processes”, were commonly identified at 10 DPA by all three methods. In addition, the PAGE analysis identified 103 DEGs at 28 DPA fibers as genes responding to environmental stimuli. Class 2, “cellular respiration processes”, were identified by all three methods at 28 DPA. All identified DEGs in this class are involved in mitochondrial electron transport and ATP synthesis through a classical cytochrome C oxidase (COX) respiratory pathway that generates ATP and ROS . The class 1 and 2 identified by SEA, MapMan, and PAGE were consistent with the results by the BioMaps analysis with the 37 common DEGs that were overlapped in 10, 17, and 28 DPA fibers (Tables 2 and 4). Class 3, “cell wall related processes” were identified by SEA and PAGE analyses at 28 DPA, but not by MapMan analysis (Table 4). SEA analysis identified 9 DEGs involved in sucrose metabolic pathways, and PAGE analysis identified 10 DEGs involved in glycosyltranserase activity catalyzing a transfer of a glycosyl or hexosyl group from a UDP-sugar (Additional file 2). Class 4, “transporting processes” were identified by SEA and PAGE analyses. SEA analysis identified sodium ion transport (GO:0006814) and proton transport (GO:0015992), whereas PAGE analysis identified genes involved in zinc and iron binding (GO:0008270 and GO:0005506), and other transition metal ion binding (GO:0046914) (Additional file 2). The stress responding DEGs identified by MapMan (Table 4) in 10 DPA fibers were further analyzed by Scavenger module and ImageAnnotator . These analyses showed that 20 DEGs were abiotic stress related genes, whereas one DEG was a biotic stress related gene (Figure 5A). Of the 20 abiotic stress related DEGs identified, 19 DEGs were predicted to be regulated by heat and 1 DEG by cold (Figure 5A). The one biotic stress related DEG was a PR-protein in the downstream portion of the biotic stress pathway, but no other biotic stress related gene was identified in the upstream of the pathway. Class 1 involved in stress response in developing fibers of the im mutant. A. MapMan-based visualization of the DEGs involved in abiotic and biotic stress in the im mutant fibers at 10 DPA. Blue and red color squares represent down- and up-regulated genes with a log2 scale, respectively. B. Hierarchical clustering of 103 DEGs identified as stimulus responsive genes by PAGE analysis in the im mutant fibers at 28 DPA. The detailed annotation data and the magnified heatmap are described at the Additional file 3. Figure 5B showed a hierarchical clustering of the 103 DEGs identified as genes responding to environmental stimuli from 28 DPA fibers by the PAGE analysis. Among them, dozens of heat shock proteins, transcripts responding to drought and osmotic adjustment (Ghi.4632.1.A1_at, Ghi.1478.1.S1_s_at, GraAffx.33059.2.S1_s_at, GhiAffx.52815.1.S1_at, and Ghi.766.1.S1_at), and flood (Gra.840.1.A1_at and GarAffx.29310.2.S1_s_at) were differentially regulated. Several alternative oxidases (Ghi.3408.1.A1_at and Ghi.9264.2.A1_s_at) were also identified in the list (Figure 5B and Additional file 3). 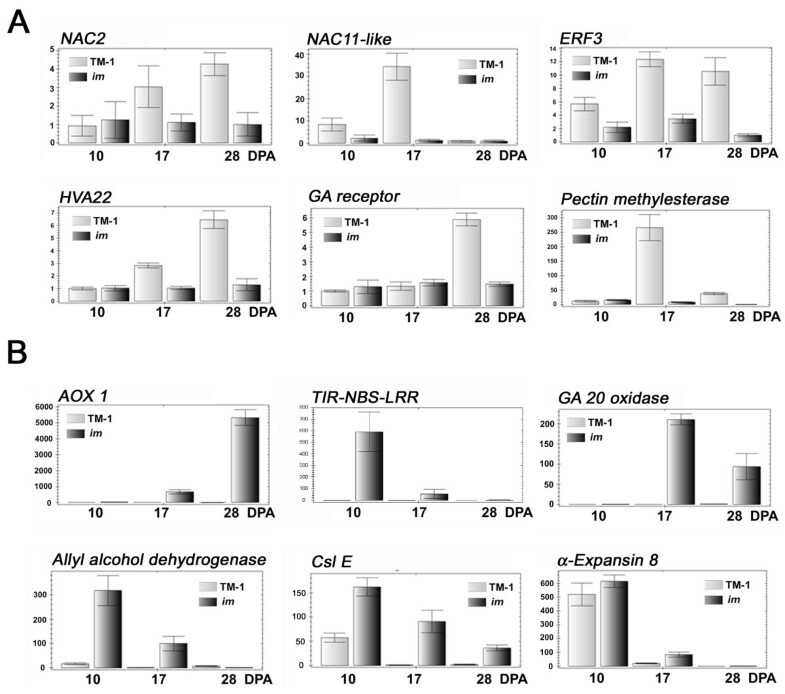 Microarray analysis identified 12 DEGs involved in a mitochondrial classical cytochrome c oxidase (COX) respiration pathway producing energy and reactive oxygen species (ROS) (Table 5). As shown in Figure 6, plant mitochondria possess additional pathways that are mediated by alternative oxidase (AOX) and the alternative NAD (P) H dehydrogenases (NDHs). They enable respiration in the presence of cyanide and rotenone . Four DEGs involved in AOX pathway and one DEG involved in alternative NDH were identified from the microarray analysis (Table 5). Most genes involved in the COX pathway were down-regulated 3–5 fold at 17 DPA and a few of them were up-regulated 2–4 fold at 28 DPA (Table 5). In contrast, all four AOX from alternative pathway were greatly up-regulated during the SCW thickening stages (17 and 28 DPA). Among them, one AOX (AOX1, Ghi.3408.1.A1_at) that was similar to Arabidopsis stress responding AOX1 was up-regulated 149 fold by the microarray (Table 5) and 5,000 fold by the RT-qPCR assay (Figure 4) at 28 DPA in the im fibers. The rotenone insensitive NADH dehydrogenase involved in another alternative respiratory pathway was also up-regulated during the im mutant fiber development (Table 5). Class 2 involved in cellular respiration and election transport chain in plant mitochondria. Genes involved in a classical cytochorme c oxidase (COX) respiration pathway generating energy and ROS were down-regulated (blue), whereas genes involved in alternative oxidase respiration pathways were up-regulated (red) in the im mutant fibers. AOX, alternative oxidase; I, NADH:dehydrogenase or NADH-plastoquinone oxidoreductase; II, succinate:ubiquione oxidoreductase; III, cytochorme bc1 complex; IV, cytochrome c oxidase; V, ATP synthase; NDHs, rotenone-insensitive NAD (P) H dehydrogenase; ROS, reactive oxygen species; UQ, ubiquione pool. Under stress conditions, AOX1 was suggested to prevent excess ROS formation by bypassing electron transfer from the COX respiratory pathway [19, 26–28] (Figure 6). Based on the results showing high levels of AOX1 in the developing fibers of the im mutant, we predicted reduced activity of the COX pathway that generated energy and ROS. To test if the up-regulation of AOX1 affects the ROS production in developing fibers of the im mutant, we measured the levels of superoxide radicals from developing fibers between TM-1 and the im mutant. Superoxide radicals were detected by semi-quantitatively staining freshly harvested developing fibers (28, 33, and 37 DPA) with NBT . The intensity of the purple color was used as a measure of superoxide amounts present in the fibers . Lower intensity of purple color in the developing im mutant fibers at 28, 33, and 37 DPA than the TM-1 fibers suggested a decreased amount of superoxide radicals in the im mutant fibers (Figure 7A). The levels of hydrogen peroxide were also quantitatively compared from developing fibers (28, 33, and 37 DPA) between TM-1 and the im mutant . The content of hydrogen peroxide in developing fibers of TM-1 increased as fibers became mature from 28 to 33 and 37 DPA (Figure 7B). At these different stages of fiber development, the hydrogen peroxide content in the im mutant was consistently lower (35.4%, 20.6%, and 58.4%) than that in the TM-1 fibers (Figure 7B). Based on the results of the reduced ROS levels along with the elevated levels of AOX in the developing fibers of the im mutant, we concluded that the activity of the classical COX respiration pathway generating energy and ROS were reduced in developing fibers of the im mutant. Comparison of ROS levels of developing fibers from TM-1 and im mutant. A. Superoxide radicals were detected by NBT staining from freshly harvested developing fibers at 28, 33, and 37 DPA from TM-1 and im mutant. B. Relative productions of H2O2 in developing cotton fibers were quantitatively measured from freshly harvested developing fibers at 28, 33, and 37 DPA from TM-1 and im mutant. Three biological replications and three technical readings at each time point were performed. The error bars represent SD. Although there are no standard GO enrichment analyses established for the cotton transcriptome, GO enrichment analyses in other plants are useful and powerful tools for interpretation of the cotton transcriptome data [8, 31, 32]. However, such analyses may identify substantially different annotated genes . To improve the GO analyses, we analyzed the transcriptome data using four different methods (BioMaps, SEA, MapMan, and PAGE). The biological processes and the GO categories (p-value ≤ 0.05) identified by each analysis were different to some extent, but all four methods identified two common biological processes, i.e., stress responding process (class 1) and the cellular respiration process (class 2) that were deregulated in the im mutant (Tables 2 and 4). The im mutant fibers elongated more slowly and had thinner cell walls than the TM-1 fibers (Figure 2). 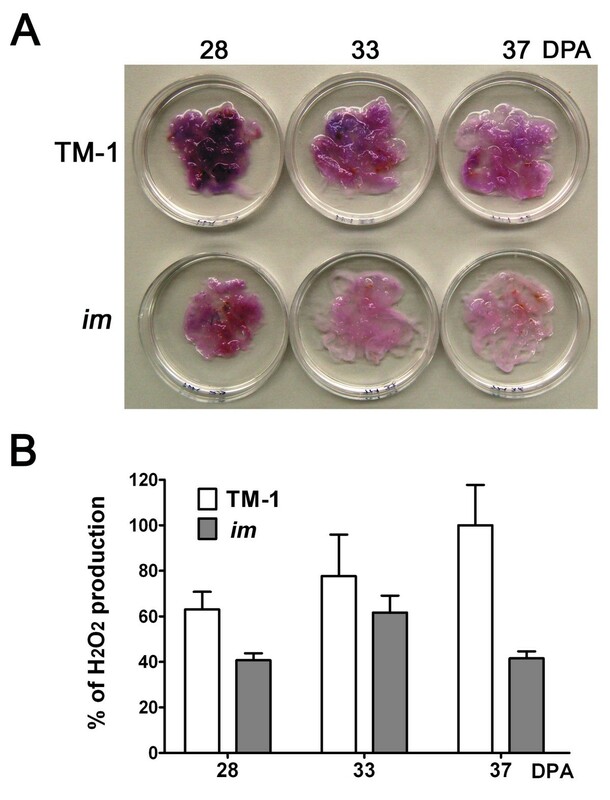 The thin cells of the im mutant fibers exhibited less efficient SCW biosynthesis. Forty five DEGs identified as being involved in reducing the degree of SCW development were down-regulated at the active SCW stage in the im mutant fibers (Additional file 4). Among the 45 DEGs identified, a gene encoding sucrose synthase is one of the main genes involved in SCW biosynthesis. Several transcriptional factors (HVA22 and ERFs) involved in the stress-related phytohormones (abscisic acid and ethylene) pathways may be involved in reducing the degree of fiber cell wall development in the im mutant (Additional file 4). We also identified 30 candidate genes involved in fiber elongation at 28 DPA in the im mutant fibers. They were up-regulated at 28 DPA in the im mutant fibers (Additional file 5). Among them, α-expansin 8, GA and brassinosteroid pathway related genes, and several heat shock proteins might help to continue the elongation of the im mutant fibers at 28 DPA (Figure 4B). The transcriptome profiles also showed that the DEGs involved in stress response (class 1) and cellular respiration (class 2) are commonly identified as being involved in regulating elongation (10 DPA), transition (17 DPA) and SCW biosynthesis stages (28 DPA). Therefore the deregulation of these genes in the im mutant fibers would be expected to contribute to the mutant phenotype (Tables 2 and 4). Based on these results, we concluded that the im gene affected both fiber elongation and SCW biosynthesis. All four GO enrichment analysis methods commonly identified genes involved in the stress response process (class 1) as being deregulated in the im mutant. Furthermore, the transcriptome profiles of the im mutant showed significant enrichments of the same DEGs previously identified as being affected in wild type cotton exposed to drought or salt stress [8, 32, 34]. Padmalatha et al. reported that 4,522 transcripts (20.7%) of the total 21,854 transcripts on the Affymetrix chip were regulated by three fold (p value ≤0.01)in the drought stressed wild type cotton fibers. Yao et al. reported that 2,993 transcripts (12.5%) among the 23,977 cotton transcripts printed on the Affymetrix chip were regulated by two fold differences (p value ≤0.05 )in the salt stressed wild type cotton roots. When the microarray results from the im mutant fibers are compared with the results from the wild type cottons stressed by drought or salt using a 2 fold difference criterion (p value ≤ 0.05), we found that 624 DEGs (72%) and 236 DEGs (27%) of the 867 DEGs identified in the im mutant fibers overlapped the DEGs in the drought stressed cotton fibers and the salt stressed cotton roots, respectively (Figure 8). 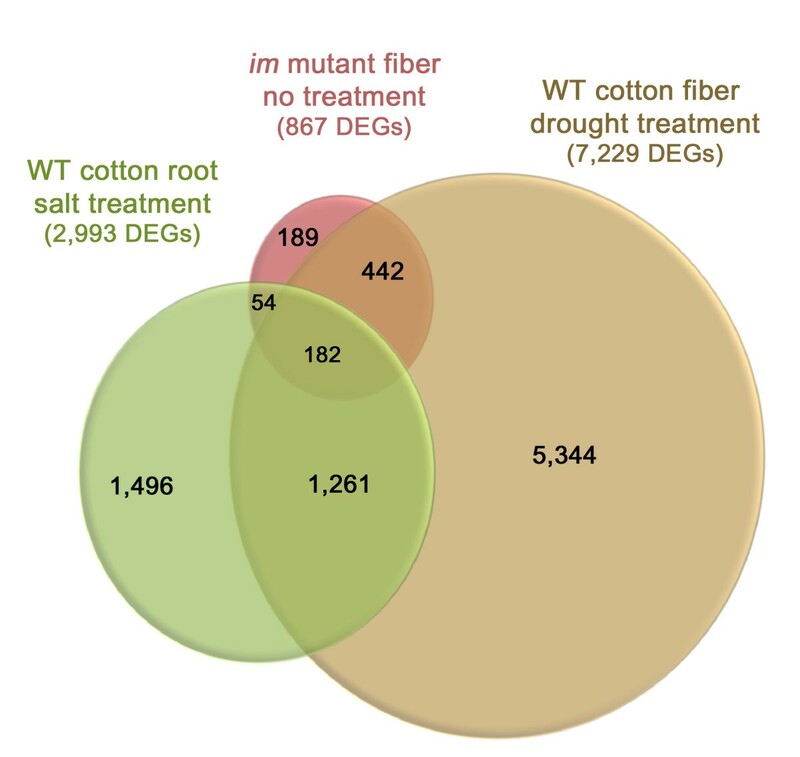 Figure 8 showed that 182 DEGs from the im mutant fibers were common to the drought stressed wild type cotton fibers and salt stressed wild type cotton roots. Among these common DEGs, four ACC oxidases for ethylene biosynthesis, two ethylene responsive transcription factors for ethylene signal pathway, and three AOXs for alternative respiration pathway for controlling ROS levels were included (Additional file 6). These results suggest that the DEGs identified from the im mutant fibers are involved in some aspect of the control of common stress response pathways [8, 19, 32, 35–40]. Venn diagrams representing the common DEGs among im mutant fibers without additional stress treatment, wild type cotton roots with salt treatment  and wild type cotton fibers with drought treatment . The DEGs showing 2 fold difference (p value ≤0.05) were compared one another. Further evidence for the im gene being involved in stress response regulation is the fact that the mutant had reduced amounts of superoxide radicals and hydrogen peroxide compared to those in wild type TM-1 fibers (Figure 7). ROS production mainly occurs during mitochondrial cellular respiration process. The lower ROS levels in the im mutant fibers correlate with the finding that an alternative oxidase (AOX) involved in the respiration was the most significantly up-regulated in the im mutant fiber (Figure 4B). AOX was originally identified from a study of thermogenic respiration in Arum maculatum and other plants where heat is produced, but no ATP is generated . AOX was suggested to be an enzyme able to reduce the level of ROS that could damage living cells, but which are generated as byproducts during ATP production from the classical COX respiration pathway [24, 25, 42]. AOX is also known as a “stress-induced protein” since it was induced by both abiotic and biotic stress such as chilling, wounding, drought, osmotic and nutrient stress, and pathogen [19, 25, 35, 36]. In cotton plants, AOX was also induced by abiotic stress . In Arabidopsis, there are two classes of AOX: AOX1 and AOX2 . The expression level of AOX1 was induced by stress, whereas expression patterns of AOX2 were tissue specific and developmentally regulated. All four cotton AOX genes contained in the microarray chips were up-regulated in developing fibers of the im mutant during fiber development (Table 5). Among them, a cotton AOX gene (Ghi.3408.1.A1_at) with 91% sequence similarity to Arabidopsis AOX1A (AT3G22370) and AOX1B (AT3G22360) was highly up-regulated in the im mutant, whereas the other three cotton AOX genes showed high similarity with Arabidopsis AOX2 and were moderately (2–5 fold) up-regulated (Table 5). Over-expression of AOX1 was previously found to decrease ROS production whereas a lack of AOX in tobacco resulted in high cellular levels of ROS . Consistent with this suggested function of AOX, developing fibers of the im mutant which contained high levels of AOX had reduced levels of ROS (Figure 7). AOX is also suggested to regulate energy balance and metabolic fluctuations in response to abiotic stress [24, 44]. Unlike the COX pathway generating ATP required for cell growth and maintenance, AOX only produces heat without generating ATP [24, 25]. Thus, energy deprivation in plants is a consequence caused by abiotic stresses reducing the activity of the COX respiratory pathway and activating the AOX respiratory pathway in mitochondria. When energy deprivation occurs in plant cells, transcript levels of genes involved in protein synthesis, cell wall biosynthesis, sucrose metabolism, transporters, chromosome and histone modification, and phytohormone signal pathways are changed . The transcriptome profile obtained from developing fibers of im mutant clearly showed the same alteration of transcriptional regulation that happened during energy deprivation (Table 3). Transcript levels of ribosomal proteins responsible for protein synthesis and XET, pectinesterase, pectin methylesterase, and sucrose synthase involved cell wall biosynthesis were all reduced. The class 4 including sodium/proton ion transport, and several metal ion binding identified from developing fibers of the im mutant fibers may facilitate recycling processes of the molecules that are degraded from starch and cell walls. The transcriptome profiles from the im mutant fibers and abiotic stressed wild type cotton plants [8, 31, 32] showed many biotic stress responding genes that were previously classified as defense mechanism related genes or pathogenesis related (PR) genes although they were not affected by treatment of cotton with pathogenic organisms (Table 3). Recent studies have shown that many biotic stress-responding genes were also involved in abiotic stress responses [20, 46–50]. TIR-NBS-LRR, one of the resistant (R) proteins known to be involved in defense against pathogenic organisms was also reported to be sensitive to temperature changes in Arabidopsis. Arabidopsis pathogenesis-related (PR) proteins known as molecular markers for biotic stress caused by pathogens were also involved in response to abiotic stress factors such as light and high concentration of salts . Thus, we suspect that the pathogen responsive genes and PR proteins described in Table 3 and Figure 5A were likely to respond to abiotic stress. Therefore, we cannot rule out an important contribution to the results from abiotic stress and these might affect the expression levels of the DEGs identified in the im mutant fibers. Abiotic stress from drought, high salinity, and low temperature are well known factors affecting fiber maturity measured as MIC value [1, 2, 5, 8]. Like the im mutant fibers in cotton, Arabidopsis SCW cellulose deficient mutants were reported to have deregulated expressions of stress related genes [51, 52]. The stress related DEGs identified in the im mutant might be caused by impairments of SCW cellulose biosynthesis in the im mutant fibers as found in the Arabidopsis cellulose deficient mutants [51, 52]. The im gene might be also involved in sensing or signaling rather than only in controlling the response to stress. Similar to a receptor-like kinase (THESEUS1) responsible for the sensing cell wall integrity and deregulating defense genes in Arabidopsis cellulose deficient mutants , unknown cell wall sensors might involve in sensing the thin cell wall and/or increasing sensitivity to stress in the im mutant fibers. The thin and impaired cell walls of the im mutant fibers might increase the stress effect. Phytohormone (abscisic acid and/or ethylene) signaling pathways related to stress responses might be also involved in reducing the degree of cell wall development in the im mutant fibers. Based on the results from microarray comparison of the cotton im mutant to a near isogenic wild type, we identified differentially expressed genes in developing fibers of the im mutant that are consistent with the loss of secondary cell wall in the mutant (Figure 9). Our results suggest that genes controlling stress responses are affected in the mutant. Our data provide evidence that phytohormone signal pathways and their transcription factors controlling these pathways are deregulated in the mutant. Some of these genes concomitantly affect cellular respiration, production of defense proteins, and ion transporters. 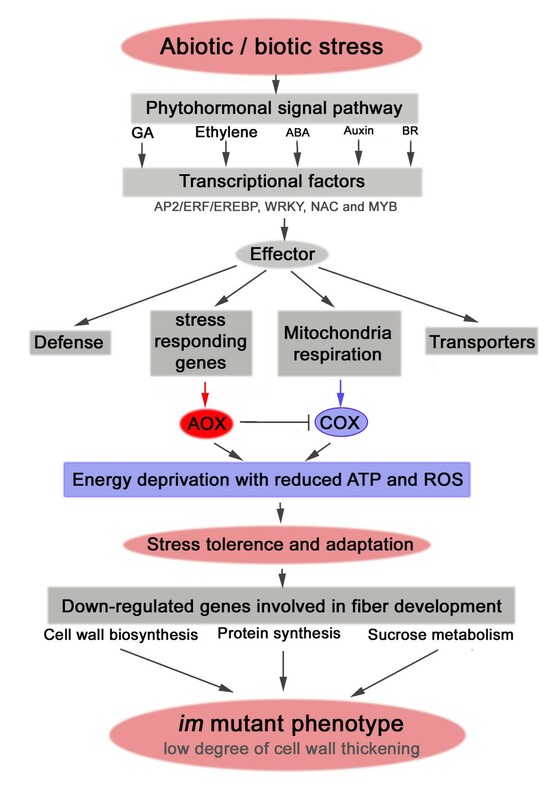 The alternative respiration pathway induced by stress reduced the levels of ROS that were originally generated by the classical COX respiration pathway in mitochondria. These up-regulated alternative respirations processes may provide stress adaptation to the im mutant and in turn cause energy deprivation. Expression of genes involved in cell wall biosynthesis, protein synthesis, and sucrose metabolism are reduced. As a result, the im mutant fibers are thin and immature. Our analyses suggest that the reduced ability to withstand stress in the im mutant may result in non-fluffy phenotype and the low degree of fiber cell wall thickness. Our results provide novel insights on genes involved in the interplay of stress and fiber maturity. Model for reducing the degree of fiber cell wall development in the im mutant. Two cotton NILs, G. hirsutum Texas Marker-1 (TM-1) and immature mutant (im) were grown side by side in a field of USDA-ARS in New Orleans, LA for multiple years between 2006 and 2011. Cotton flowers were tagged at day of anthesis. Two biological replicates of cotton bolls from TM-1 and im mutant were harvested at 10, 17, 24, 28, and 44 DPA before 9 A.M. The developing fibers from 10–30 ovules that were harvested from 2–4 different cotton plants used for each biological replication. For RNA extraction, the immediately frozen fibers with liquid nitrogen were used. For image analysis, the intact ovules associated with developing fibers were stored in 50% ethanol. For measuring fiber properties, the developing fibers were manually ginned from the ovules and dried in 40°C incubator. For microarray transcriptome analyses, two biological replications at three different developmental time points between the two NILs grown in year 2011 were used. For verifications of the microarray results, the fiber samples harvested in multiple years (2006, 2008, and 2011) were used. During the all processes from planting, tagging, harvesting, and ginning, the two NILs grown side by side were equivalently treated at the same time. Standard conventional field practices were applied during growing season. The soil type in New Orleans was Aquent dredged over alluvium in an elevated location to provide adequate drainage. Mature fibers from the two NILs were ginned using a laboratory roller gin, whereas developing fibers that were too fragile to be ginned by the roller gin were manually collected. Before the measurements of fiber properties, fibers were pre-equilibrated with 65% humidity and 21°C for 48 hours. The average fiber properties of five tests were determined by the Cotton Fiber Testing Lab in USDA-ARS-SRRC located in New Orleans, LA. Mean fiber length (Lw) from mature fibers was obtained from five replicates with 5000 fibers per replicate using Advanced Fiber Information System (USTER Technologies Inc., Knoxville, TN). Fiber lengths from developing fibers (10, 17, and 28 DPA) were manually measured . The distance from the chalazal end of the ovule to the tip of the relaxed fibers by warm acidic water was measured to the nearest 0.01 mm with a digital caliper. Average fiber lengths of developing fibers at each time point were calculated from two replicate samples with 30 ovules per replicate. Statistical analyses and construction of graphs were performed using two-way ANOVA and Prism version 5 software (Graph-Pad Software, Inc., San Diego, CA). Developing fibers (17, 24, and 28 DPA) were immediately immersed into 50% ethanol to maintain moisture for keeping original fiber structure. To prevent young and fragile fibers from being damaged by dryness, developing fibers were never dried until they were embedded. Matured fibers were harvested from cotton bolls when bolls were open at 44 DPA. Mature fibers were completely dried and embedded for microscopic image analysis. Both mature and developing fibers were thin-section cut, and photographed using the method previously described . The cross-sections were analyzed using the image analysis software designed for measuring cross-sectional areas, perimeters and calculate circularity . Average wall area (A) excluding lumen and perimeter (P) of the fiber cross sections were calculates from three hundred individual results for each fiber cross-section. Circularity (θ) representing the degree of fiber cell wall development was calculated using the equation, θ = 4πA/P2[3, 4]. Developing cotton fibers (10, 17, and 28 DPA) were manually ginned from cotton ovules and frozen with liquid nitrogen immediately. Total RNA was extracted from the frozen fibers using the Sigma Spectrum™ Plant Total RNA Kit (Sigma-Aldrich, St. Louis, MO) with DNase1 digestion according to the manufacturer’s protocol. The quality and quantity of total RNA were determined using a NanoDrop 2000 spectrophotometer (NanoDrop Technologies Inc., Wilmington, DE) and an Agilent Bioanalyzer 2100 (Agilent Technologies Inc., Santa Clara, CA). The microarray experiments were conducted by following the minimum information about a microarray experiment (MIAME) guidelines . Affymetrix GeneChip® Cotton Genome Arrays (Affymetrix Inc., Santa Clara, CA) representing 21,854 cotton transcripts were used to compare expression levels between TM-1 and im mutant. For each sample 500 ng of cotton fiber RNA was utilized for labeling using the Affymetrix GeneChip® 3′ IVT Express Kit and Cotton Genome Array hybridizations were performed according to standardized Affymetrix protocols. The developmental time-points from two NILs were 10, 17, and 28 DPA with two biological replicates at each time-point. Procedures for data normalization and assessment of statistically and biologically significant genes were performed as described previously . The Affymetrix microarray dataset was deposited in the ArrayExpress database with the expression number E-MEXP-3901. Statistical analyses were performed to identify significantly differentially expressed genes in fibers of each cotton NIL at each time point with p value ≤ Bonferroni corrected P value of 0.05/N where N is numbers of probe set on the chip. Primary annotation was performed with the latest version of the Affymetrix annotation (Release 33), and additional annotations were performed using Blast2GO , and blastx in The Arabidopsis Information Resource (http://www.arabidopsis.org/Blast/) and Gossypium raimondii genome sequence (http://www.phytozome.net/cotton.php). Gene Ontology (GO) enrichment and visualization of microarray results were performed according to the described methods [13, 22, 59]. For the SEA and PAGE analyses, the identified DEGs were compared with Gossypium raimondii genome . For the BioMaps and MapMan analyses, Arabidopsis orthologues of the identified DEGs from the im mutant were compared with Arabidopsis genome sequences (http://www.arabidopsis.org/index.jsp). For statistical analyses and GO enrichment, the p-value cutoff for significance was 0.05. The experimental procedures and data analysis related to RT-qPCR were performed according to the Minimum Information for Publication of Quantitative Real-Time PCR Experiments (MIQE) guidelines . The cDNA synthesis reactions were performed using the iScript™ cDNA Synthesis Kit (Bio-Rad Laboratories, Hercules, CA) according to the manufacturer’s instructions with 1 μg of total RNA per reaction used as template. Control cDNA synthesis reactions to check for genomic DNA contamination during RT-qPCR consisted of the same template and components as the experimental reactions without the reverse transcriptase enzyme. Thirty seven pairs of specific primers were designed from twenty nine DEGs for validation of the microarray results. The RT-qPCR reactions were performed with iTaq™ SYBR® Green Supermix (Bio-Rad Laboratories) in a Bio-Rad CFX96 real time PCR detection system. Thermal cycler parameters for RT-qPCR were as follows: 95°C 3 minutes, 50 cycles of 95°C 15 seconds, 60°C 30 seconds. Dissociation curve was generated and used to validate that a single amplicon was present for each RT-qPCR reaction. The calculations for amplification efficiencies of the target and reference genes, and the relative quantifications of the different target gene transcript abundance were performed using the comparative Cq method as described in the ABI Guide to Performing Relative Quantitation of Gene Expression Using Real-Time Quantitative PCR (Applied Biosystems, Foster City, CA) with the following modification: the average of three reference gene Cq values was determined by taking the geometric mean which was used to calculate the ΔCq values for the individual target genes. The endogenous reference genes used in the RT-qPCR reactions were the 18S rRNA (U42827), ubiquitin-conjugating protein (AI730710), and α-tubulin 4 (AF106570). The reference and target gene primer sequences are shown in Additional file 7. Three biological replications and five technical replications were used for each time-point sample. Superoxide radicals were detected in situ by nitroblue tetrazolium (NBT) staining . Freshly harvested developing fibers (28, 33, and 37 DPA) from TM-1 and im mutant plants were vacuum infiltrated for 5 min with 50 mM potassium phosphate buffer (pH 7.8) containing 0.1% NBT and 10 mM sodium azide and incubated at room temperature for 10, 30, and 60 min. The reactions were stopped by transferring the fibers into 95% ethanol. Relative productions of H2O2 in developing cotton fibers were quantitatively compared between TM-1 and im mutant using a xylenol orange assay [30, 62]. Freshly harvested cotton fibers (28, 33, and 37 DPA) of the same weight were immediately vacuum infiltrated in a freshly prepared solution containing 25 mM FeSO4, 25 mM (NH4)2SO4, 2.5 M H2SO4, 100 mM sorbitol, and 125 μM xylenol orange and then incubated in room temperature for 2 h. Hydroperoxides were reduced by ferrous ions in acid solution and formed ferric product-xylenol orange complex that is detected spectrophotometrically at 560 nm. This research was supported by the USDA-ARS CRIS Project # 6435-21000-016-00D and Cotton Incorporated-sponsored project #12-199. Authors thank Drs. Kenneth Ehrlich and Doug Hinchliffe of USDA-ARS-SRRC, Dr. Don Jones of Cotton Inc. and two unknown reviewers for critically reviewing the manuscript. We thank Dr. Russell J. Kohel of USDA-ARS-SPARC for providing cottonseeds of TM-1 and im mutant and Dr. Kater Hake of Cotton Inc. for helping us initiate the project. The authors acknowledge Ms. Tracy Condon for measuring fiber property, Ms. Holly King and Jeannine Moraitis for image analyses. Mention of trade names or commercial products in this publication is solely for the purpose of providing specific information and does not imply recommendation or endorsement by the USDA that is an equal opportunity employer. HJK conceived the research, collected samples, determined ROS levels, analyzed fiber properties and microarray data, wrote and edited the manuscript. DDF conceived the research and edited the manuscript. YT performed statistical analysis and analyzed the microarray data. HSM extracted total RNAs and verified microarray results with qPCR analyses. CDD was responsible for microscopic image analysis. All authors read and approved the final manuscript.